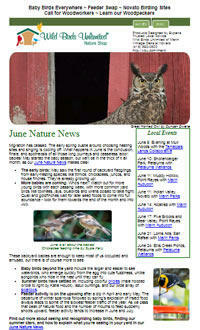 To learn more about what's going on in nature and in our store, sign up for our email newsletter. We send out one email each month filled with the latest bird and nature updates (arrival of migratory species, nesting time for local breeders, etc. ), educational articles about attracting birds to your yard, our profiles of local birding sites, and a listing of upcoming bird walks and nature talks. You can see an example of a past issue here. Everything you read in our newsletter is written by us, the staff of Wild Birds Unlimited of Marin; this is not a corporate or chain store email propaganda machine. We will not sell, share, or distribute your information to any outside sources and you may unsubscribe at any time.